Often, there are just a few words to describe a really good ride. 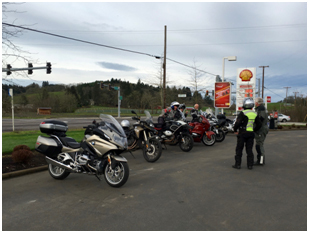 This was the case for our Wednesday March 3, 2016 ride to Sutherlin from Eugene. 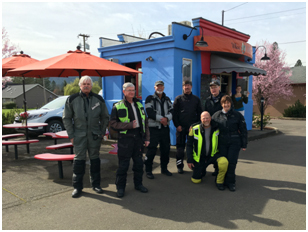 The riders met at the Jackson Shell at the intersection of Green Hill and Route 126 in Eugene. 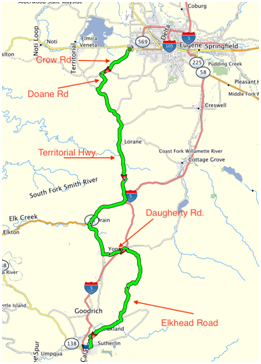 At the appointed hour, we set off on the route shown above. The weather cooperated nicely. No rain, and even periods of lovely sunshine. Temperatures late in the ride were approaching the 60 degree mark. Ahhhh! Road conditions were near perfect. Heavy rains over the past few weeks had cleaned the roads nicely. Also, the route we followed is characterized by good surfaces for motorcyclists, nice sweepers and a few sections of fun twisties! Nellie has a great selection of fantastic sandwiches and soups. Besides the good food, Nellie and her staff are spirited, and very friendly. The free mini cookies and brownies were greatly appreciated. Check out Nellies on your next trip to Sutherlin.